Nowadays, computer monitors, TVs and even the latest mobiles support 4K. But let's face it; though Netflix, Amazon, and Sony are offering movies and TV shows in 4K resolution, it's still far from enough. Not until there is more 4K content, you can't get the most of your device. There is a solution: 4K Ultra HD TVs, as well as a number of Blu-ray players and Home Theater receivers, include the 4K upscaling ability that can improve the incoming 720P/1080P to as near as 4K. 1. Lost HDMI signal when upscaling to 4K content - "I just bought the UN65MU8000 tv but it frequently loses the hdmi signal when I click to play 4K UHD content (both from Netflix or Amazon Video). I have to unplug the hdmi and re-plug it back in for the TV recognize it again." 2. Blank TV screen - "I have a Samsung UE65HU7500 4k. When i upscale video to 4K play on the tv, the screen becomes blank." 3. Messed up quality - "I try to play a HD video after i set the system to 4k, but the video playback is totally messed up and blurry. Any idea on what's changed/going on? I think it should give me better output." Expensive 4K TV has good 1080P to 4K upscaler engine built-in. They will generate quality close to 4k from 1080P, 720P or any other videos you input, unless the import video is really poor in quality. But those TVs come at extremely high price (for example, the Sony FWD100Z9D is priced at $60,954.66), while with most others, you may have above problems. Those problems aside, the TV 1080p to 4k upscaler allows you to play 4K on TV only. What about other 4K displays? In this guide, we will show you how to convert 1080p to 4K resolution and turn everything into the UHD quality, so that you can play 4K on uhd TVs or upload to YouTube, Vimeo and other 4k host sites. All you will need is a piece of HD 1080p to 4K upscaling software. MacX Video Converter Pro - Upscale 480p, 720p/1080p video files to 4k (3840×2160 or 4096×2304) with truly UHD quality and 5x faster processing speed. Also downscale 4K ultra HD videos to HD/SD resolution in 40%-70% smaller size yet discernible quality differences. 1080P VS 4K: Why Should You Upconvert 1080P to 4K? What is 1080P: 1080p refers to 1920×1080 pixels of resolution. When will you need to upscale 1080p videos to 4k? Now nearly all the latest mobiles like iPhone X, iPhone 8, iPhone 7, Samsung Galaxy S8/Note 8 all have support for 4K videos, and more 4K tvs are catching on. In fact, on a small display like iPhone or Samsung device, you may hardly notice the differences between full HD 1080P and UHD 4K. But if you tend to sit on your sofa to watch contents on the TV, then you will want to up-convert 1080p to 4K to get the best viewing. What is 1080p to 4k upscaling? From the above brief explanation, you can see that 1080p has 2,073,600 pixels in total - namely 1,920 across, multiplied by 1,080 rows of pixels. While for 4K video, it has four times the resolution pixel dimension of 1080p. Therefore, when you play 1080p on a 4K TV, there are three times of blank pixels need to be fill. To convert 1080p to 4k, it involves a process named upscaling. This tech usually uses an interpolation algorithm to optimize all the available pixels rather than using the limited 2,073,600 pixels. It adds details by detecting the extracting the known pixels and duplicating them. Some 4K TVs, Blu-ray players and also a good 4k video converter will do it for you. To upconvert 1080p to 4K with the top quality yet fast speed, MacX Video Converter Pro is the best 4k video processing solution. 1. It will upscale SD 480p, 540p, hd 720p and 1080p to 2k and 4k ultra HD, without further adjustments and with stunning quality. 2. It will transcode mp4, mov, avi, etc from/to 4k format HEVC h.265 mkv and mp4, thus allow 4K video playback on iPhone, iPad, Android, other devices. 3. It will downscale and compress 4K UHD to HD and SD files, with 40%- 70% smaller size, and also excellent quality. 4. It will free download 4K videos, movies, TV shows etc from YouTube, Vimeo, Dailymotion etc with superfast speed. 5. With Intel/Nvidia/AMD hardware acceleration tech, the HD to 4K upscaling software ensures a 5x faster 1080p to 4K, or 480p, 720p to uhd upscaling. Step 1: Launch the 4k video upscaling software and click + Video to import the SD, HD 720p, 1080p videos to be converted to 4k. You can import as many videos to upscale from 1080p to 4k as you want as it supports batch processing. Step 2: Select the 4K video format you want. 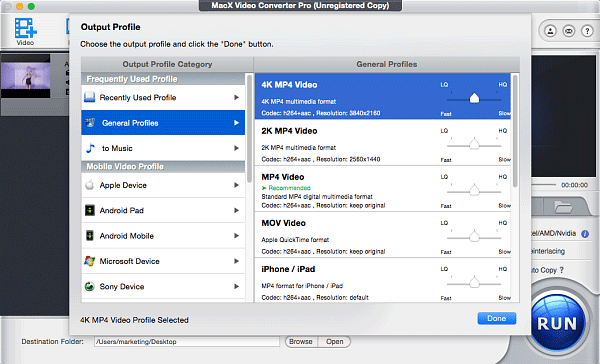 To upconvert 1080P to 4K, select the 4K MP4 Video from the General Profiles. By choosing the 4K format, the 4k video processing tool will automatically upscale 1,280x720, 1,920x1,080 etc without further tweaks or adjustments. You can then watch 4k videos on UHD TVs, iPhone X, iPhone 8/Plus, 7/Plus, Samsung Galaxy S8/Note 8, Huawei Mate 10, other mobiles and upload to 4k-hosting sites Vimeo, YouTube etc. 1. Tick on the Hardware Encoder box to enable the hardware acceleration tech. This tech will drive the whole to 5x faster speed. 2. In addition to SD, HD 720p, 1080p to 4K, you can also convert and compress 4K videos to HD/SD files, like 4K to 720P, 1080P at anytime you want. 3. If you have a 4K video recorded by ultra HD cameras and want to move it to mobiles, you can also convert 4K into HEVC mp4 for wider compatibility. Step 3: Make necessary adjustments if you want. There are options for you to modify video and audio settings, resolution, video bit rate, frame rate, aspect ratio, audio encoder, sample rate, audio bit rate, and audio channels. Step 4: Click browser to set a folder to save the output file and then click Run and start to upconvert 1080p to 4k UHD. The whole process is fast. MacX Video Converter Pro can quickly upconvert HD 720p/1080p to 4K and also downscale 4K to 2K, 1080P, 720P with sharp image quality. Also convert among video formats, HEVC to H.264, VP8 to VP9, H.264 to H.265, MKV to MP4 etc. All TV models from LG, Sony, Panasonic, Samsung, Vizio etc. are supported. How to Upscale 720p Video to 4K UHD? Where to Get 4K Content?